Wyoming wants you. Or more accurately, Central Wyoming College (CWC) wants you to earn a degree, credential, or certificate in geospatial information science and technology (GIST) from the school and then put your skills to work in Wyoming. CWC wants you so much, it’s offering free tuition through a state program to qualified Wyoming residents and scholarships to nonresidents. Read the article. 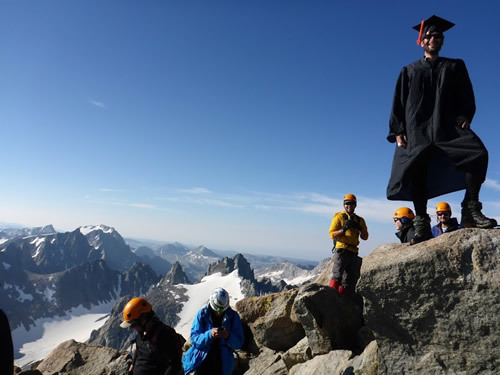 Anthony Dube celebrates his graduation from Central Wyoming College atop Gannett Peak, Wyoming’s highest point. Find out how to create a Time Aware app and embed it in a Story Map Journal or Story Map Series. Read the tip. Get fired up for GIS Day! Take part in Ashcloud Apocalypse, a disaster-risk mapping exercise based on the scenario that a mega volcano has erupted. GIS Day is November 18, 2015. Read the article. Use these 10 ideas to put on a GIS Day program that people will remember long after the last piece of GIS Day cake is eaten. Read the article. A 4-H GIS team collected and contributed data to a US Fish and Wildlife Service project aimed at managing and eradicating Limonium sinuatum, a species of sea lavender that’s invasive in California. Read the article. Wildfire locations in the western United States, including the fire acreage and perimeters, are displayed on a new Story Map Journal created by the American Red Cross. The mapping app also shows where to find Red Cross shelters and offices. View the Story Map Journal. Esri chief scientist Dawn Wright and colleague Rafael Ponce say we know more about the surfaces of the moon and Mars than Earth’s ocean floor. What technologies would help map the oceans more accurately? Read the article in Hydro Insights. Katrina Scarborough, property appraiser for Osceola County, Florida, talks about how her office uses Esri ArcGIS in analyzing the value of properties. Watch the video. Use the new Survey123 for ArcGIS app to create form-based surveys, analyze the data from the surveys, and publish the findings in ArcGIS. Esri will present live training on using the app on October 29, 2015. Take the training. The beta for Quartz, Esri’s new generation of ArcGIS Runtime, is now available to developers who use the Android, iOS, and Java platforms. Quartz supports developing apps with capabilities such as 3D viewing and analysis, smart mapping, on-the-fly analysis, vector mapping and visualization, and much more. Read the blog. Take Quartz for a test drive. See what Esri’s developers are cooking up for app developers, including 3D viewing and analysis capabilities throughout the ArcGIS platform and mapping and visualization that support vector map tiles. Watch the video. Esri technology evangelist Bern Szukalski explains, step by step, how to add albums from your Flickr account to story maps such as Story Map Journal and Story Map Tour. Read his tip. Learn to create, compare, and share design scenarios in Exploring Design Alternatives Using GeoPlanner for ArcGIS. Take the web course. 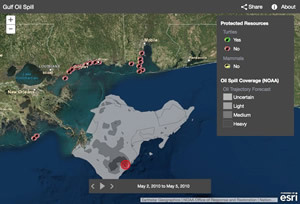 Meet the winners of the Map Gallery competition at the Esri User Conference and see, from the judges’ perspective, what made the maps stand out. Read the article. Enter your ZIP code or city in this online mapping app to see whether you live in an Oktoberfest kind of town, where beer spending bubbles to the top. Check your community's Oktoberfest score. 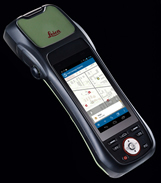 Esri and Leica offer ZenoCollector, a new high-accuracy solution that uses ArcGIS Online and Collector for ArcGIS. Order today. When zombies appeared in a California city, the Esri Disaster Response Program team sprang into action with a series of zombie apocalypse information products. An impact summary map created with ArcGIS showed the number of households and businesses affected by the creatures. Read the blog. Sixty years ago, 36,100 people called Tallahassee, Florida, home. Today the city’s population tops 189,000. Tallahassee–Leon County GIS created a story map to document the city’s growth. View the story map.